With so many types of microphones to choose from, simply understanding the technical terms that describe them will help you select the right one for your application. Microphones can be categorized by their Application Design, Polar Pattern, and Transducer Principle. For example, a popular vocalist microphone is a Handheld Cardioid Dynamic, lecturn mics tend to be Gooseneck Cardioid Condensors and Omni-Directional Condensors are prominent in recording studios. The following explains those terms. Headworn: Allowing hands-free use, some designs go over the ear, others use an armature, to position the microphone element near the mouth. Ideal for instructors. Good choice when feedback is a problem. Lavalier or Lapel: Typically attaches to clothing with a clip, allowing hands-free operation. Used for presentors. Careful placement is required to avoid noise from clothing and feedback. Fragile, handle with care. Choir or Overhead: Designed to be hung from above, but can also be stand mounted or hidden in scenery. Try to use as few as possible to avoid feedback and room noise. Fragile. Boundary and PZM: placed on table tops these microphones are often used in conference and meeting spaces. Careful placement is required to avoid room noise and feedback if used near loudspeakers. Gooseneck: Flange mounted on a lecturn, boardroom dais, or stand mounted, these are a very good choice for public speaking. Flexible adjustment accommodates different sized talkers. Shotgun: Commonly used on TV and film sets, sporting events, and wildlife for isolating specific sound sources. Narrow forward polar pattern (see below) requires precise aiming. 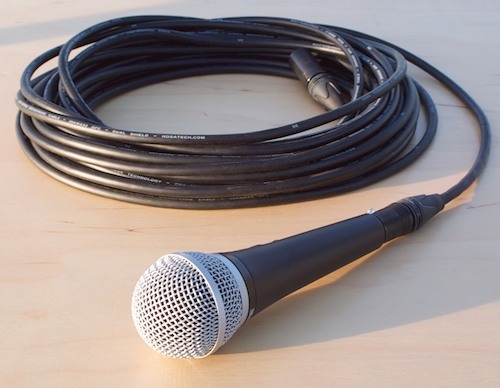 Corded or Hardwired: The microphone connects to the sound system with a portable or installed cable. More reliable than wireless for critical applications. Always use quality cables and connectors. Wireless: A battery powered wireless transmitter connected to the microphone transmits the audio via radio frequencies to a receiver connected to the sound system. Great when cables would get in the way. For maximum range, proper frequency selection and antenna setup required to avoid audio dropouts and radio interference. 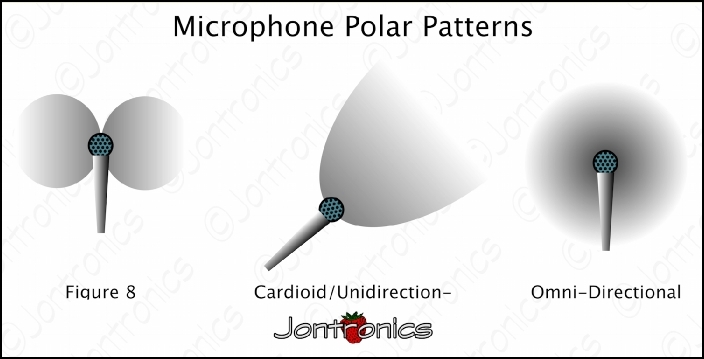 The polar pattern describes how a microphone responds to sound from different directions. To avoid feedback in live sound situations, microphones with directional polar patterns are usually used. Cardioid: This microphone is sensitive to sound at it's front and much less sensitive at it's sides and even less at it's back. This directionality helps avoid amplifying room noise and loudspeaker feedback. Aim the microphone close to your desired sound source, and away from loudspeakers and any other undesired sound source. Uni-Directional: Similar to a cardioid, this microphone is sensitive to sound at it's front and not to it's sides and back. Omni-directional: This microphone picks up sound in all directions regardless of the direction that it is aimed. These microphones are great for recording, typically offering great sensitivity and flat frequency response. They are however usually a challenging choice for live sound, there is no way to aim them away from loudspeakers, so they will usually feedback at much lower levels than a cardioid microphone. Figure 8: This microphone picks up sound from the front and back and is less sensitive to the sides. These are commonly used for recording and broadcast applications. There are several designs that can convert acoustic sound waves into electrical energy, these are the most common types used in live sound. Dynamic: Uses a small induction coil inside of a magnetic field. Typically less sensitive to feedback and able to survive with rough handling. Condensor: Uses a diaphragm that acts as one plate of a constantly charged capacitor. Condensor microphones require a power source, usually provided via a mixer with phantom power or in some designs by a battery or power supply. Popular in recording studios, and some live sound applications. Typically, but not always sensitive to feedback. Fragile, handle with care. Higher manufacturing costs than dynamic. Ribbon: Uses a thin metal ribbon suspended in a magnetic field to generate the electrical signal. Typically very high quality sound reproduction, but older designs were fragile and have had limited use outside of recording studios, newer manufacturing materials have improved durability and they are seeing wider use in live sound.